Shooting High | News and Features | Style Weekly - Richmond, VA local news, arts, and events. A private tour of Richmond’s surprisingly chic new gun range. General Manager Edward L. Coleman designed Colonial Shooting Academy to include not only 51 shooting lanes but also a store, cafe and private club. “This is going to be a destination point for people to come together after work and gather together,” he says. Fifty-one shooting lanes. One hundred twenty tons of steel plate. A tactical range that can absorb .30-caliber rifle fire from all directions. Also: Nice bathrooms. Shopping. And a cute cafe. Ladies, this place was made for you. A private preview of the nearly-finished Colonial Shooting Academy on West Broad Street reveals a building that looks more like a Short Pump retail store than a grimy, casing-littered gun range. When it opens next week, on April 3, the $12 million Colonial Shooting Academy will be the largest nonmilitary indoor range in the country. 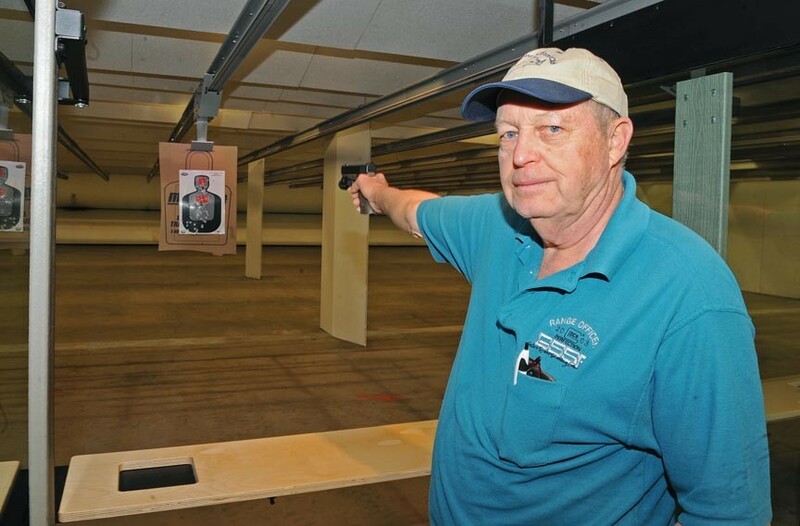 (Although Scottsdale Gun Club, another upscale range in Arizona, is preparing to add more lanes to reclaim the title.) The range already has about 600 members. And a good number are women. "More ladies are buying firearms today than anybody," says Edward L. Coleman, the range's general manager. So he designed Colonial Shooting Academy to meet their needs. The retail area is bright and open, with nary a duck call to be seen. The walls are shades of pumpkin and avocado. Several classes for novice shooters, including some with female instructors, will be offered. "Isn't it amazing?" raves Bonnie Murphey, a registered nurse at Henrico Doctors Hospital and an enthusiastic shooter. Fifteen years ago, when Murphey was a home health nurse who made long trips out to the country, she says she encountered some truck-driving rednecks who harassed her and tried to run her off the road. That's when Murphey bought her first firearm. She never had to use it in self-defense, she says, but she discovered she was a good shot. When Murphey found out the new range was opening, she decided to seek out other women who liked guns. "I'm single, and I don't have anyone, necessarily, to shoot with," she says. So she launched the Richmond Ladies of Calibre meet-up group two months ago. It has 62 members. Murphey recently held a potluck at her house, to which members brought chili and guns. They oohed over one woman's very-Richmond revolver: a .22-caliber Smith & Wesson that was purchased in 1960 at Miller & Rhoads. The Ladies of Calibre also got to tour the gun range. They loved everything about it, Murphey says: the bright lighting, the digital target distance controls, the store, the décor and the bathrooms. Most of all, Murphey says, they like "that you can shoot a machine gun on your birthday." That's one of the membership perks at Colonial Shooting Academy, which is included in the $34.95 monthly fee (plus a one-time initiation fee of $100). Members of the military and law enforcement pay $29.95 a month. The most ardent gun enthusiasts can pay $200 a month, plus a $2,000 initiation fee, for a Constitution membership. That allows them to use seven private lanes as well as a swanky members' lounge with overstuffed chairs, a gas fireplace and a private gun valet to clean and retrieve their guns. Members can hold parties there too — sorry, no booze allowed. Don't be fooled by the pretty trappings; the range takes shooting seriously. All members, however experienced, are required to take a safety course yearly. The shooting lanes are separated by clear glass partitions, so range officers can see everything that goes on. And a sophisticated security system with 39 cameras and thumb-scanning locks ensures no one tries anything stupid. In the basement is a special area that only law enforcement officers are allowed to use. (There's even a bay where a van can pull up, so undercover officers can enter without being seen.) There, Coleman is installing lockers, showers and exercise equipment so officers can get their heart rates up before they hit the tactical range. "This is a very unusual range," Coleman says. For one thing, it's blue. The walls and ceiling are covered in hard ballistic rubber, backed by sheets of plywood and steel. Users can fire in any direction, and the bullets will be trapped in the wall. The tactical range has 12 targets programmed to turn in sequence for rapid-fire practice, as well as one shaped like a running man that zips along the back wall. For tactical training that's as real as it gets, officers head into what's called the shoot house. It's a 1,800-square-foot maze of doorways, halls and sliding walls. A row of small rooms can represent motel rooms, jail cells or even classrooms. The range will provide targets and furniture, dim the lights and even play sounds. "We could have recordings in here of children crying, dogs barking. People screaming," Coleman says. "Whatever they need." When a visitor walks into an empty room, Coleman steps from a hiding place behind the door.